The mission of Ginkgo is simple: to use sustainable methods to grow food for people who struggle with poverty and illness. 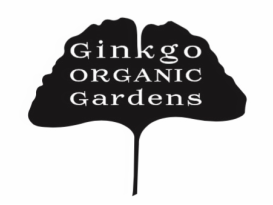 Our longstanding success in following that mission results from a set of principles that have guided Ginkgo since the garden's founding in 1994, as well as a partnership model for community production gardening. If a method sounds crunchy, we've probably tried it. Not everything has worked (our hugelkultur bed was underwhelming; and the less we say about our milpa experiment, the better)--but a lot has worked. Our yields are, no doubt, lower than they would be if we applied chemical fertilizers, and our crops are buggier than they would be if we used pesticides. However, we think that the flavor of what we grow is unmatched and that our fruits and vegetables are better for our recipients. The total cost of ownership is lower, to boot, as our primary expenditures are usually for seeds. We like to say that we have two sorts of volunteers: those who volunteer some, and those who volunteer more. What passes at the garden for a steering committee is composed of a group of the more obsessed and committed volunteer gardeners who show up every weekend throughout the season. We tend to make decisions collectively, often while standing over one of our raised beds. We're open to new ideas, so long as those ideas support our mission. This informal governance model has its weaknesses (we have a tendency to overthink things); however, its strength is in its resilience. In particular, we seem to have avoided founder's syndrome: all of the original founders of the garden, as well as many long-term volunteers, have moved on--but the garden remains. We donate everything we produce. The simple decision to donate all of our produce has had profound consequences and benefits for the garden. We can garden to a larger scale, doing things like dedicating entire beds to a single crop. We are free to experiment. When you give away what you grow, any amount is appreciated; if a new crop or technique fails, we can just start over. It's all upside. More people are willing to help us. There is an undeniable appeal to the idea of contributing to the effort to grow food for people who might otherwise not be able to afford it; the hundreds of people who have worked with us over the years are evidence of that appeal. We avoid a lot of the politics related to the proprietary aspects that can attend community gardens comprised of many small individual plots. No one is passive-aggressively weeding the bed of another gardener; there aren't any squabbles over the rain barrel. We haven't been the victim of vegetable thieves or vandals. We're not knocking community gardens that don't donate their produce; we think that everyone deserves the opportunity to grow their own food. We just know that there is something special about working together to grow food intended to be given freely to others. Over the last couple of decades, Ginkgo has developed a number of important partnerships. We increasingly see ourselves as a conduit for the expression of the good will of our partners. Like us, a lot of people want to help others and improve the world around them: we're fortunate in that we can provide opportunities to do those very things. Our model brings together a variety of different groups, representing land support, volunteer support, and recipients. Ginkgo has been a NeighborSpace garden since 1998. NeighborSpace administers the garden property, providing necessary services such as liability insurance coverage, and works with the City of Chicago to coordinate things like water supply. NeighborSpace professionalizes our groovy little enterprise. We often tell volunteers that we couldn't do what we do without them. We're not kidding. Ginkgo has no paid staff, and the garden is too big for our small steering committee to work unaided. The contributions of volunteers are vital to the garden's mission. Chicago Cares, which has supported Ginkgo consistently since 2003, with biweekly visits by large groups of enthusiastic volunteers. DePaul University. In addition to the groups of students that work at the garden as part of DePaul's annual Vincentian Day of Service, a number of student organizations at the university have organized work sessions. AmeriCorps, which often sends small armies of volunteers to help. We have also hosted corporate volunteer days from companies such as Salesforce, Deloitte, and Carnival Cruises. Although we appreciate large groups of volunteers, we depend on individual volunteers. The garden keeps going thanks to individuals: the folks who stop by for a couple of hours on the odd Saturday; the diehards who show up when it's raining or windy; the families. We couldn't ask for a better recipient partner than Vital Bridges. Ginkgo and Vital Bridges both started at around the same time. We've gone from delivering our produce by foot (when Vital Bridges was located near the Sheridan stop) to delivering by bike cart (to the "new" location in Edgewater). Because Vital Bridges is open on Saturday, we are able to deliver our produce soon after harvesting it. Clients know that we're coming; we know that people will take what we've grown. Over the years, the Saturday Ginkgo delivery has become tradition at Vital Bridges. After we arrive at the pantry, we arrange our produce on carts, in baskets that the pantry keeps around for us. We bring the carts to the pantry's waiting area, where clients are free to select what they want. We stay with the cart, answering questions about the produce. It's like a farmer's market.